I recently broke 1 million again, which is about the max I was at. It’s been quite profitable to wait to level up Pokemon until the applicable Legendary arrives, so I can target my level ups. Should I not need them, I only level up one or two more perfects I have on hand. For instance, I’m thinking that Regigigas is the next Legendary Raid Boss, but since I’m not certain, I’m waiting until then to see what it is to make sure. Should it not be Regigigas, I’ll level up something else. If it is Regigigas, my Fighting-types are already leveled up, so I’ll likely level up my perfect Medicham for Great League battles. While I know Rayquaza is on the horizon this weekend, I have adequate numbers of counters to counter it just fine without needing to level up more Ice-types this time around. Next time it comes around though, I’ll be leveling up more Ice-types. This system keeps a solid amount of Stardust in my belt, enough to satisfy Ultra-Friend Special Trades, but keep enough on hand for any emergency level ups. I do exactly the same. That way, I always have a minimum of 2 million dust, just in case. The coolest of all here is that it is a round number. Impressive amount of dust accumulated, do you have star piece running all the time whenever you play? It’s hard/lucky to manipulate it to an exact round number like this, especially with dust from eggs hatches. What’s it at now @MrSparkle? I got up to 1.6 million before leveling up two Pokemon in preparation for Giratina, and now I’m at about 1.05 million. 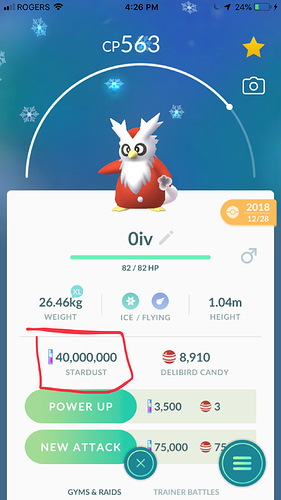 It really isn’t that hard to have higher stardust counts, I’ve found. I average about 20,000-30,000 Stardust earned a day, just by playing for a few hours and focusing on weather-boosted catches–and also catching everything I see if I have surplus Poke Balls. Hatching eggs adds up as well. Do the match and that’s around 200,000 Stardust a week, or 800,000 a month. Many of the YouTubers don’t level up their Pokemon that much or that far because they’re very retentive on the breakpoint tactic–although they often forget how friend boosts change that–so they level up to around level 30, which doesn’t require a lot of Stardust comparatively. Once I adopted a tactic to level up only what I needed for a new Legendary Raid Boss and keeping trades to what I need for my Pokedex, I’ve found that gathering Stardust and keeping it isn’t that hard. 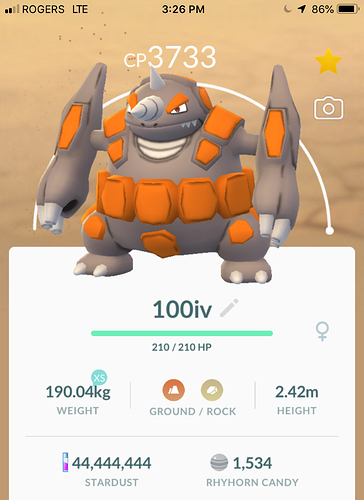 i dont power up anything anymore, but i also dont earn any stardust. Mostly from eggs and other ways rather than catching. i am around 340K"ish" mostly spending on trading and don’t need a ridiculous amount of dust. Been there done that used it all on battle ready pokemon. Will be back to the million mark when next gen come out where ill be catching like a bot again. Once you already have teams of all the best counters maxed out stardust becomes kind of pointless in the game. You seem to have more game resources than anybody could ever realistically use. Once you reach that point, why not just start over with a new trainer?